There are a few things I can't do without when I run: comfortable shoes, my keys, a ponytail holder, and music. I generally try to have an ID or insurance card with me, as well, since the drivers in my town pay little attention to things like people crossing the street. For the past few years, when I am on a solo (i.e. sans doggie) run or in a race, I've used an armband for my iPhone, and shoved my keys & cards in a small pocket in my pants, or perhaps in my socks, depending on what I was wearing. This started to become a less-than-ideal situation, since my armband seemed to start outgrowing my arms, meaning I often ended up carrying the armband-wrapped iPhone in my hands. I don't really care to carry things in my hands while I run. My friend A had been a long-time proponent of a little belt worn around her waist -- almost a fanny pack of sorts, at least to me. I generally don't like anything around my waist, either, but had gotten rather used to it since running with my dog using a hands-free leash. After one last time of my phone ending up around my wrist because I couldn't get the armband tight enough, I caved and bought myself one of these belt doo-hickies. 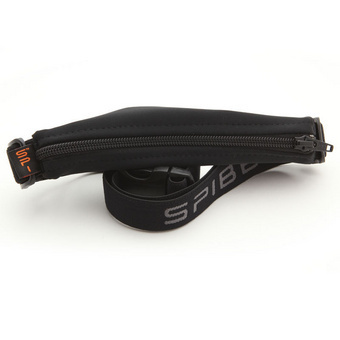 The SPIbelt is a belt outfitted with a small, neoprene pouch large enough to hold a phone, car key, money, and an ID or card or two. It sits very close to your body, and, the best thing, it doesn't move while you're running. It was so still, in fact, I often forgot I even had it on. The size out of the package is deceiving...it is so small it's hard to believe it will hold all your goods. But hold them it does. I even had space to spare. And, despite being weighted down with all the goods, it didn't move, at all. I wore it just around my hips, and there it sat. So call me a convert. How I got along without this gem of an accessory for so long I am not sure.